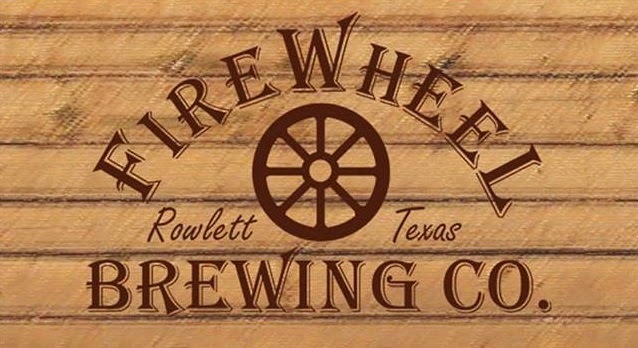 Following news of their expansion in April, the FireWheel Brewing Company of Rowlett has completed construction of their new facility, with plans to unveil the site during a daylong celebration on December 6. Located at 3313 Enterprise Drive, less than a mile from their previous location, founder Brad Perkinson has spent the last few months prepping the space while installing a new 15-barrel brewhouse. Now, he and brewer Nate Breitzman are ready to showcase their work as they prepare to take the next big step in FireWheel's future. In anticipation of the grand opening, several new beers are in the works, one of which will be an Imperial red ale called Redneck Redemption (9.3% ABV). The brewery will also bring back Cool Beans, an espresso Porter that was originally released last year. These will take their place alongside other brewery offerings among twenty-four taps in FireWheel's new taproom. Perkinson indicated two of the taps will be nitro-enabled, though these may not be operational until after the debut. A ribbon cutting ceremony will occur at 11 a.m. the morning of the event, with the party expected to go on until 9 p.m. that night. Special releases will be staggered over the course of the day, but attendees can expect to choose from over 15 of the brewery's beers while enjoying live music and the culinary creations of attending food trucks. The festivities will be both dog and kid friendly, and Perkinson points out that he'll have at least 4 flavored root beers (non-alcoholic) on tap for the little ones. Also note that admission is free, with beer to be sold by the glass. Andrews announces partnership with Funkwerks, Inc.
Today, Andrews Distributing has announced a new partnership with renowned saison and Belgian-style brewer, Funkwerks, Inc. of Fort Collins, Colorado. Brewery founders Gordan Schuck and Brad Lincoln met while attending the Siebel Institute in Chicago, eventually going on to establish Funkwerks in 2009. They created their award-winning Saison recipe in Schuck's backyard prior to stepping up to a one-barrel system in 2010. Since then, their beers have won awards at both the Great American Beer Festival and World Beer Cup. Kelli Hopson, Andrews brand manager for the brewery, noted that "Funkwerks has built a unique portfolio focused around saison-style beers" and "Andrews is thrilled to share this world-class beer with local beer lovers in Dallas/Fort Worth." According to a press release, initial shipments of the brewery's beers will arrive in North Texas after the first of the year, with an official launch on track for January 12, 2015. Both Schuck and Lincoln are expected to travel to the Metroplex that week to attend events celebrating the brewery's arrival at Andrews retailers across the area. Once on sale locally, Funkwerks' Saison, along with Tropic King and Deceit will be available on draft and in 750 mL bottles. Consumers will also be able to purchase the Saison and Tropic King in 330 mL four-packs. Further details will be released closer to launch. In the meantime, for more information on Funkwerks, visit their website at www.funkwerks.com. At a private event hosted by the House of Blues this week, the Rabbit Hole Brewing Company laid out their plans for the coming year. The brewery announced that a new limited-edition beer is in the works, and that they'll also begin packaging their products in both bottles and cans. 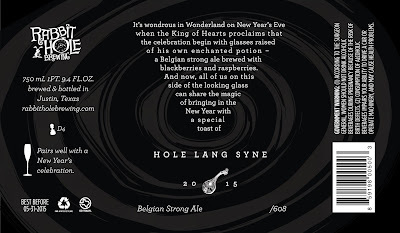 Hole Lang Syne, created specifically for New Year's Eve, is a Belgian Golden Strong Ale brewed with raspberries and blackberries. According to a description provided by the brewery, it's "characterized by a soft, delicate malt flavor," which combines with "noble hops and a complex combination of fruit esters and spicy phenolics derived from a historic Belgian yeast strain" to produce a beer worthy of special celebrations. The beer will debut on December 13 at the brewery, as Rabbit Hole celebrates its first year of operations with a Hole New Year Party. "This beer represents our reflections on 2014," says co-founder Laron Cheek, and we want "to share our gratitude...with all of those who've supported us in the last year." This will also mark the first time a Rabbit Hole beer will be sold at retail. A limited run of 608 individually numbered 750 mL bottles will begin arriving at stores beginning on Tuesday, December 16. Why 608, you ask? That's a reference to the brewery's address in Justin, according to Chief Sales Sensei, Tait Lifto. As if that wasn't enough, the brewery is also reviewing designs ahead of the expected roll-out of their year-round portfolio in cans. Mike Modano's 561 Kölsch, Rapture Fusion Brown Ale and 10/6 English IPA will appear in six-packs sometime in the first quarter of 2015. More information on that will be released as it becomes available. Details on the Hole New Year Party can be found on Rabbit Hole's Facebook page. VIP, General Admission and Designated Driver tickets may be purchase in advance via Eventbrite. 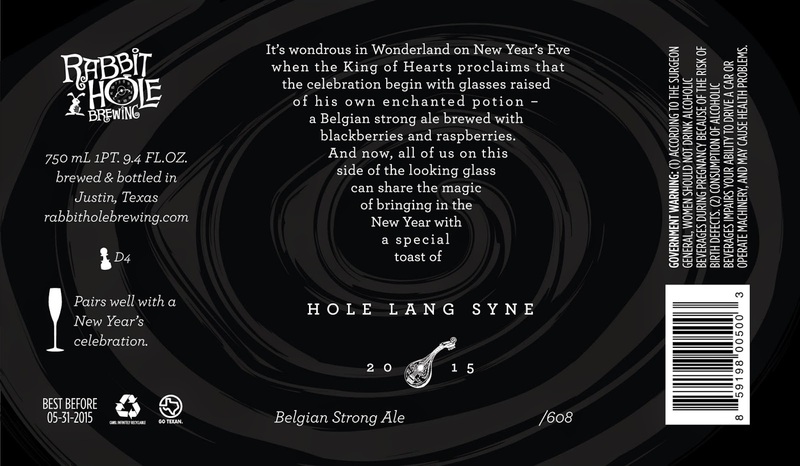 Of course, the brewery's founders also hope consumers will follow in the spirit of the beer's creation and ring in 2015 with a toast of Hole Lang Syne. One chance to do just that will occur at the Flying Saucer in Addison, during a Glass Night/Tap Takeover featuring the brewery on December 31. The 2014 edition of North Texas Beer Week featured many types of events we've come to enjoy in the Metroplex on what is now a regular basis, just multiplied many times over. Over the course of ten days, around 300 total events included various pint nights, rare tappings, beer dinners and even a taproom debut at a recently opened brewery. The culmination, though, had to be Friday night's Brewer's Ball held at the Renaissance Dallas Hotel. Limited to only 500 tickets, Beer Week's marquee event offered attendees the chance to mingle with brewery owners, brewmasters and reps from both local and national craft breweries in a private setting. And while it was indeed a ball in a ballroom, it was billed as black-tie optional. Yes, there were people in tuxedos, suits and cocktail dresses, but there were plenty of others in jeans, shorts, tennis shoes and ball caps. For all the concerns about an assumed dress code, a lighthearted discussion on social media suggested that pants were the only thing unequivocally required. Food was catered by establishments well-known for their commitment to craft beer like the Meddlesome Moth, LUCK, The Common Table, Goodfriend and Jack Mac's Swill & Grill. The Malai Kitchen, a West Village restaurant that began brewing operations earlier this year, also provided snacks, as did the East Hampton Sandwich Company and Luscher's Post Oak Red Hots. Selections ranged from sandwiches, sliders and sausages, to a variety of finger foods and a fantastic smoked salmon crostini (courtesy of LUCK). On that point, of particular note was the fact that there was no actual "tasting card." Attendees weren't subjected to the standard festival limit of a dozen pours, and they didn't have to lay down additional funds for a dozen more. This allowed everyone to sample freely without having to succumb to the slash of a sharpie. Of course, the one subject seemingly on everyone's mind who did not attend was the $125 price tag. I suppose whether it was worth it or not depends on your point of view. Granted, if you add up the typical cost of a VIP festival ticket to money spent on food trucks and additional tasting tickets, you're probably not going to pay over $100 per person. Then again, Brewer's Ball wasn't your average beer festival. It was an exclusive event held in a lavish and comfortable setting, not to mention being an essentially all you can eat and drink affair with rare brews and food from a number of highly regarded restaurants. In my mind, thinking about the experience as a whole, it was well worth the cost for what was arguably one of the most intimate and unique beer-centric events North Texas has ever seen. More than that, though, Brewer's Ball and North Texas Beer Week in general showed once again how far the local industry has come in a very short time. Three years ago such an event wasn't remotely possible in North Texas. Now, on a given night during Beer Week we have to choose between numerous high profile events, many of which feature industry figures from around the country. Celebrations like this, along with the continued success of local breweries in national competitions, do nothing but raise the profile of our region nationally. So, I ask you then...can we finally say we live in a craft beer town?